As a Sales Manager, NetSuite gives you visibility to keep a pulse on your team’s performance and the tools you need to close important deals. Mark Grogan is a sales manager at Wolfe Electronics. Mark’s dashboard is a quick reference guide showing up-to-the-minute sales activity and other key performance indicators. With tailorable comparison, Mark’s dashboard gives him absolute and relative sales performance information. Mark, like any sales manager, is most concerned with how his team is performing against forecast. He has overall visibility to this month’s forecast on his dashboard. Mark can examine deal details by team members to understand which opportunities to really focus on to exceed quota. Mark can even make adjustments on the fly based on knowledge of his representative’s forecasting habit. For instance, Mark knows that Krista tends to low-ball her opportunities, so he makes an adjustment to ensure accurate executive visibility. 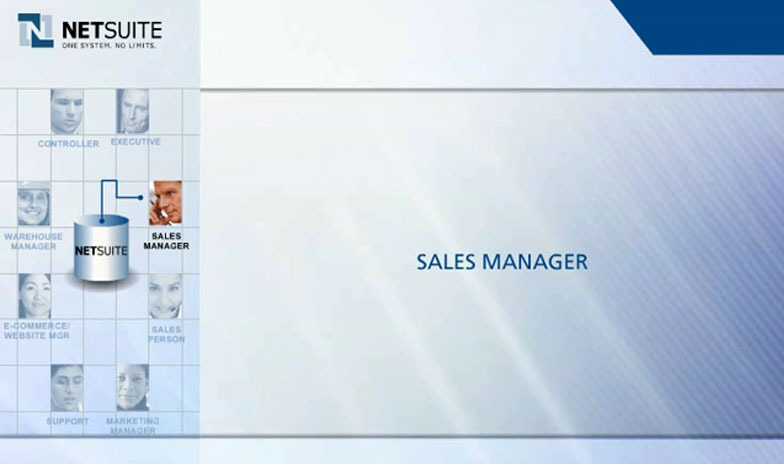 And with control over representative’s commission approval, sales managers hold the key to the ultimate incentive. With these same NetSuite capabilities at your disposal, you can keep your team focused and motivated to consistently meet and beat expectations.